The musician delivers a flawed but exquisitely moving and detailed new memoir. Bruce Springsteen broke a guitar string about halfway into one of his early songs, “Spirit in the Night,” the first time I ever saw him perform, in April 1974. The show, billed as a “dance concert,” was held in the cafeteria of the student center at Seton Hall University. I’d heard good things about Springsteen from older friends in our mutual home state of New Jersey—one of his early bands, Steel Mill, had played at my buddy Doug’s eighth-grade graduation party—but my expectations were still low. After all, this was just a dance show by a Jersey Shore bar band in a college cafeteria. The rhythm section kept up the tune’s loping jazz-funk groove while Springsteen walked off-mic to his guitar case and got out a replacement string. There were no roadies on the side of the stage. There was no stage. While he attached the new string, Spring­steen told a long, casually paced story about growing up in Freehold, a blue-collar town by the Jersey Shore. He talked about trying to tune his first guitar, alone in his bedroom, while his father hollered at him through the vent in the floor between his room and the kitchen. He described how his dad would turn up the gas range to try to smoke his son out of the house. The tale was poignant, funny, and vividly detailed—an impeccable little narrative that came off as earnest and utterly spontaneous. He wrapped up the story just in time to test the new string by strumming the downbeat chord of the song’s chorus. I curled up in the palm of Bruce Springsteen’s hand. Over the three decades since that early phase in Springsteen’s long career, he has had a very, very good life without writing books. There was only one hardcover title credited to him until this year. In November 2014, just in time for winter-holiday sales, Simon & Schuster published a glossy-stock edition of the lyrics to one of Springsteen’s story songs, “Outlaw Pete,” with illustrations. By that time, though, he had begun work on what would slowly take form as a memoir, writing longhand in notebooks that he carried with him on the road. Inevitably titled Born to Run, it was published this fall to instantaneous success on the best-seller lists, providing Springsteen with his first No. 1 hit in a couple of years. As everyone in the Seton Hall cafeteria could tell in 1974, Bruce Springsteen was a good writer long before he became “a author” of books. The fable-like story he spun about his father foreshadowed his memoir, which, in fact, includes an extended telling of the same tale. He has always had a keen sense of character, applying it with varying degrees of subtly to the denizens of his songs, from zanies like Crazy Janey and Wild Billy in “Spirit in the Night” through the displaced millworkers and emotionally wounded vets of his glory days in the ’80s, to the avaricious financiers of his 2012 polemical album Wrecking Ball, his last of all-original material. Springsteen has always displayed a sharp sense of place as well, with a gift for evoking atmosphere in his lyrics: the fireworks forcing a light on the stony faces on the Asbury Park boardwalk in “Sandy”; the barefoot girl sitting on the hood of a Dodge drinking warm beer in “Jungleland”; the smokestacks reaching like the arms of God into a sky of soot in “Youngstown.” And he has long had a refined narrative sense, writing dozens of playlets in song form, from the two-stanza drama of an abandoned wife clinging to hope in “Reason to Believe” to the five-minute novella of heartbreak in the shadow of drug-running on the Mexican border in “The Line.” Being a rock star, Springsteen has naturally exercised all of those talents in the service of his own public image as well as his music. Both, after all, are part of the work of stardom. But with his star already high in the stratosphere, it seems that Springsteen might have been chasing something closer to the ground in Born to Run. Over time, Springsteen came to recognize his father’s brooding and rage as symptoms of psychological trouble that he himself has shared. The closest thing to headline news in Born to Run is probably the candor with which Springsteen describes suffering from depression, which has been acutely serious at times. He has been getting therapy and taking antidepressants, and he discusses all of this with only a tinge of the self-absorption typical of celebrity recovery narratives. 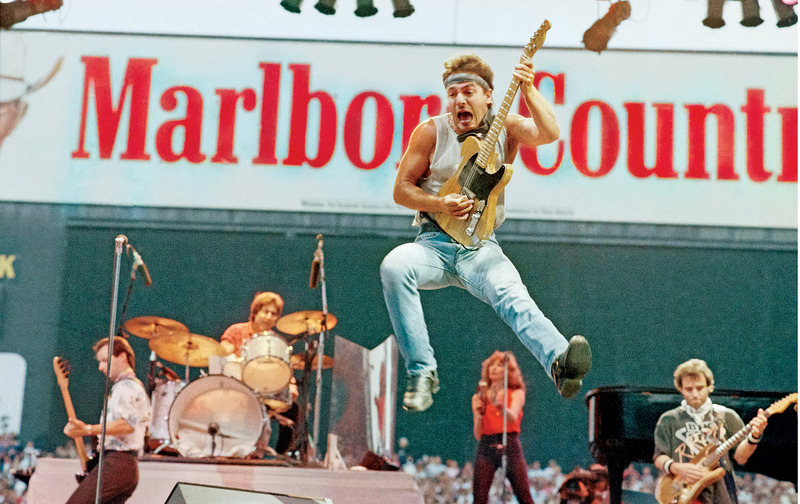 The theme of redemption courses through Born to Run, as it does the rest of Springsteen’s work, most overtly in songs like “Thunder Road,” “The River,” “Maria’s Bed,” “Highway Patrolman,” “Rockaway the Days,” and “Bring On the Night,” with their dime-novel sinners who find absolution, typically in the love of a woman named Mary or Maria. Even “Outlaw Pete,” the song repackaged as a children’s book, is a redemption allegory. As Springsteen explains in an author’s note, “Outlaw Pete is essentially the story of a man trying to outlive and outlast his sins.” In his new book, we read about Springsteen’s mother finding her life of self-sacrifice paying off in her son’s success, and we see Spring- steen redeeming his childhood anxiety and geekiness through his arena act of macho triumphalism. Born to Run, like its subject, is smart, ambitious, and mesmerizing, but uneven—diminished, though not terminally, by a current of self-satisfaction running below its Jersey-boy humility. The long passages of “and then I wrote…” reminiscence grow wearying, and it would be awfully hard for any mortal to relate to Springsteen once he makes Born in the USA and becomes a megastar of arena rock. He describes the title song as “one of my greatest and most misunderstood pieces of music.” Poor Bruce, his greatness glorified for the wrong reasons. Flawed but exquisitely detailed and often moving, particularly in its treatment of the father-son relationship at its core, Born to Run is a book whose sins are redeemed by the grace of its humanity.